Many outdoor enthusiasts spend weeks in Patagonia. But, if you’re short on time, working with a tight budget (Patagonia is one of the most expensive parts of South America) or not interested in multi-day treks or other extreme activities, you’ll see some of the region’s most popular highlights with this 6-day itinerary. Starting in El Calafate, Argentina and ending in Punta Arenas, Chile, both of which can be accessed from nearby airports, this itinerary is ideal for anyone already planning to spend time in both countries. If you’re traveling from Chile to Argentina, this can also be done in reverse. El Calafate is a small town situated on a large, windy lake in the vast Patagonian steppe. The town itself is quiet and walkable. The main street is lined with outdoor gear and souvenir shops, tourist offices, and Western-style restaurants offering Patagonia craft beer, burgers, and Italian food. Overall, it’s charming and has what you need, but it’s also pricey and not worth spending a lot of time in. The primary reason for coming here is to visit Patagonia’s most famous glacier, El Perito Moreno. Whether you’re flying from Buenos Aires, or taking a bus from somewhere else, the journey to El Calafate is long. So, on day one, relax or take a walk along main street, treat yourself to a nice meal, and prepare for an early start on day two. If you plan to see El Perito Moreno Glacier with a tour (more on that later), this is your opportunity to book it. Food Tip: For a quick, cheap snack, stop at Green Market on the main street next to Pietro’s for an empanada or healthy cold sandwich to go. I got a carne picante (spicy beef) empanada there for around AR$ 40 ($1.42 USD), and it was MUY rico. In fact, it might have been the best empanada I had in all of South America. For those with an adventurous spirit (and a healthy budget), these tours take you onto the glacier itself. The physical demand is high— you’ll spend around 3.5 hours trekking on the glacier, plus 3 hours (total) of hiking on the moraine. The entire length of the tour is about 12 hours including breaks for lunch, a short boat ride, and the shuttle from El Calafate, which is approximately 90 minutes each way. Tours are offered daily through any of the offices in town. * You can always try shopping around or negotiating price, but most companies more or less offer the same experience, and all seemed to have agreed on a set price, so you may not have much luck. If the cost or physical demands of doing Big Ice are too much, Minitrekking is a great option. The itineraries are essentially the same, except you spend 1.5 hours trekking on the glacier versus 3.5 hours, making it both less expensive and physically demanding. The most economical way to see the glacier is walking around the boardwalk in Los Glacieres National Park. The network of elevated trails takes around two to three hours to complete. While you don’t get as up close and personal with the glacier, I think the broader perspective gives you a better sense of its immensity. The trails are mostly flat with some stairs, so it’s not difficult for people of average physical fitness. The best way to get to the park is by bus, which leave from the main terminal in El Calafate and drop you off in a parking lot near the start of the trail. If you’re doing a day trip, it makes sense to purchase a return ticket, which I recommend buying the day before. Several companies offer the route, and prices are similar, with the main difference being departure time. There are several buses leaving between 7:30 am and 9 am, returning between 2:30 pm and 4:30 pm. All of the schedules allow ample time to walk the entire circuit. If you’re done early, there is an upscale lodge near the parking lot where you can buy a coffee or whisky with glacial ice; or, head to the nearby beach and admire the view. Temperatures can vary throughout the day, and it can get quite windy, so dress in layers, and wear comfy shoes. The lodge is the only place to buy food, and it’s on the pricy side, so if you’re on a budget, I recommend packing a lunch. View the glacier up close with a 45-minute boat tour. For this option, you can book in advance at one of the tour offices in El Calafate. These tours also typically include transport to and from the glacier, with pick up at your accommodations. If you’re doing the land-based option, it’s also possible to purchase ferry tickets at the park as an add-on, which is slightly cheaper than booking a tour in town. This was already a pretty expensive day trip, so we opted to skip this. Puerto Natales is the launching point for another one of Patagonia’s most famous destination– Torres del Paine National Park in Chile. Buses between El Calafate and Puerto Natales leave from the main terminal. Several companies offer the route, but all pretty much have two departures per day– one around 8 am and another around 4:30 pm. Normally the trip takes 4 hours. Buy your ticket the day before and choose the 8 am option so that you have some time in Puerto Natales to prepare for another early start the next day. The iconic granite towers in Torres del Paine — one of the most unique and impressive geological formations in the world — are arguably the most famous landmark in Patagonia. To see the towers, you can hike the W circuit, a popular 4-5 day trek through Torres del Paine National, but you don’t need to hike the W to see them for yourself. 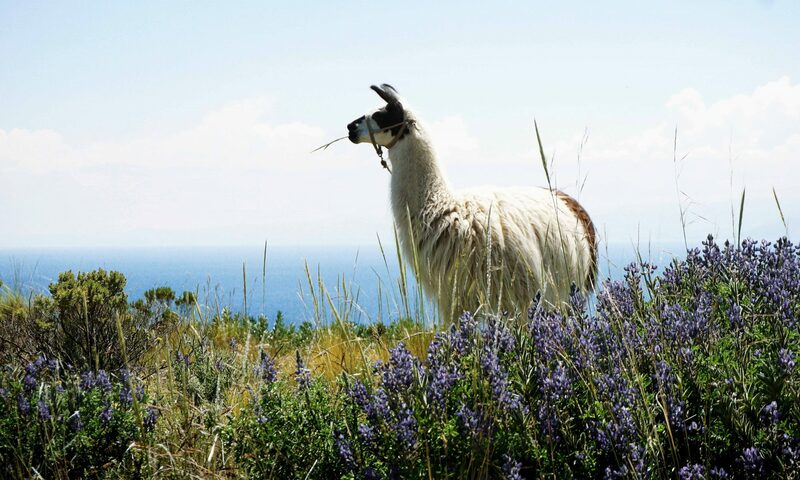 You can also do what is commonly referred to as the Base Hike, which can be done as a day trip from Puerto Natales. The Base Hike takes you past deep ravines, mossy forests, and crystal-blue streams before reaching the park’s crowned jewel, the Mirador del Torres. The path is well marked, so it’s nearly impossible to get lost… and it’s crowded. We didn’t go more than 15 minutes— total — without seeing another person, so set your expectations accordingly. The hike takes between 5 and 8 hours, depending on your fitness level, and is medium to medium-high difficulty, with the hardest parts being a long, steep uphill near the beginning and a rock scramble section near the end. What goes up most come down — the steep uphill becomes a long, arduous downhill on the return. It’s brutal on the knees, so I highly recommend bringing trekking poles, which can be rented in Puerto Natales. On Day 5, take the 3-hour bus ride to your final destination, Punta Arenas. Buses between Puerto Natales and Punta Arenas run every hour, so take your pick, but I’d recommend leaving sometime in the morning to give yourself extra time in Punta Arenas. The most popular attraction in Punta Arenas is taking a trip to Isla Magdalena, an excellent opportunity to see tens of thousands of wild penguins in their natural habitat. This excursion can be done on Day 5 or 6. Trips to the island are cancelled frequently due to weather, so look up the forecast ahead of time and plan accordingly. There are two ways get to Isla Magdalena: tour or public ferry. Tours, booked through any of the tour offices in town, leave early in the morning, so they must be booked on Day 5 for the following morning. The other option is via public ferry, Melinka. During the summer months, December to March, the Melinka ferry departs from the ferry harbor every day at 5 pm. The voyage takes two hours each way, and you get one hour to walk around the island. Boats can fill up, so it’s a good idea to purchase your ticket at least a few hours beforehand. Depending on when you visit Isla Magdalena, and if you have extra time before your flight, I recommend visiting Museo Nao Victoria, where you can check out 1:1 replicas of the ships captained by Darwin and Magellan back in the 1800’s. Trust me, they’re pretty effin’ cool. The museum is located 4.5 miles (7.5 km) from town, and can be reached by taxi ($4,000-5,000 CLP / $6-7 USD from the main square), or by bus. The entrance fee for the museum is $4,000 CLP ($6 USD), which I felt was a good value.